(a) Inspect the turning torque of the ball joint. (1) Secure the front stabilizer link assembly in a vise using aluminum plates. (2) Install the nut to the front stabilizer link assembly stud. (3) Using a torque wrench, turn the nut continuously at a rate of 3 to 5 seconds per turn and take the torque reading on the 5th turn. 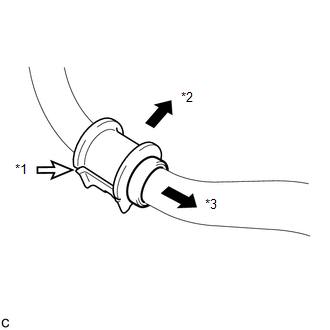 If the turning torque is not within the specified range, replace the front stabilizer link assembly with a new one. (b) Inspect the dust cover. (1) Check that the dust cover is not cracked and that there is no grease on it. 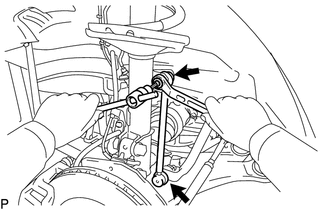 Refer to the procedure up to Remove Steering Link Assembly (See page ). (a) Remove the 2 nuts and front stabilizer link assembly LH. 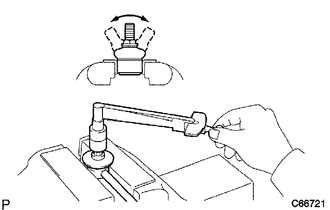 If the ball joint turns together with the nut, use a hexagon wrench (6 mm) to hold the stud bolt. 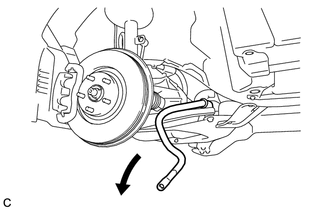 (a) Remove the front stabilizer bar with bracket from the left side of the vehicle. (a) Remove the front No. 1 stabilizer bracket LH from the front No. 1 stabilizer bar bushing. (a) Remove the front No. 2 stabilizer bracket LH from the front No. 1 stabilizer bar bushing. (a) Remove the 2 front No. 1 stabilizer bar bushings from the front stabilizer bar. (a) Install the 2 front No. 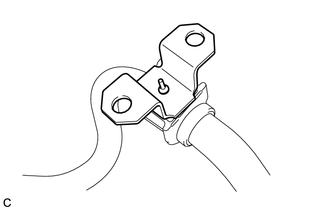 1 stabilizer bar bushings to the front stabilizer bar as shown in the illustration. When installing the front No. 1 stabilizer bar bushings, make sure that the cutout faces the rear of the vehicle. (a) Install the front No. 2 stabilizer bracket LH to the front No. 1 stabilizer bar bushing. (a) Install the front No. 1 stabilizer bracket LH to the front No. 1 stabilizer bar bushing. 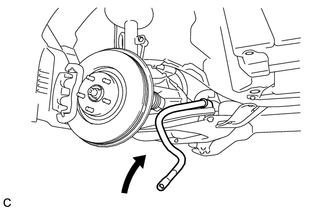 (a) Install the front stabilizer bar with bracket from the left side of the vehicle. (a) Install the front stabilizer link assembly LH with the 2 nuts. 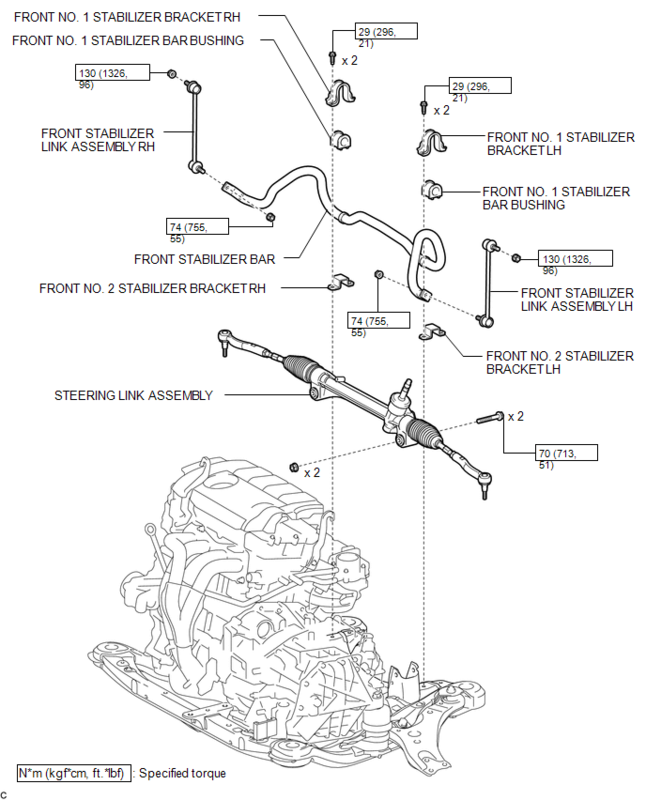 Refer to the procedure form Install Steering Link Assembly (See page ).